This week I’m presenting a few clips from some of my favorite Romani* themed movies. From a youtube commenter: The two Gypsy musicians provide a running commentary through the film, like a Greek chorus. One of them plays an accordion and sings, while the other plays a Jew’s harp. The movie begins with them singing their recurring song, to which the refrain is “I’m miserable, I was born that way, I sing to sing my pain away, I wish Mama dear that I had but dreamt it all.” t’s about people taking a bus ride to Belgrade, just before the Second world war. I have not seen this film and just came upon by chance when searching for other clips but it looks like the kind of film I’d be thrilled to see. From IMDB: Grga Pitic and Zarije Destanov are two old friends – and rivals – who haven’t seen each other in years. But a series of events beyond their wildest dreams leads to a raucously funny reunion filled with gypsy mobsters, dirty deals and shotgun weddings. A thoroughly enjoyable film, I recommend it for one of those days when you feel beat and you wonder why the world is so screwed up. The first thing I thought after seeing this film is “Why can’t every comedy movie be like this?” Okay, I’m simple but everything about this film is fantastic! By the way, you might recognize the actress Branka Katic who plays the love interest, Ida from the HBO series Big Love. Gadjo Dilo, 1997. Directed by Tony Gatliff, filmed in Romania. From IMDB: Stéphane, a young French man from Paris, travels to Romania. He is looking for the singer Nora Luca, whom his father had heard all the time before his death. Wandering along a frozen road, he meets old Izidor, a member of the Roma (Gypsy) and tells him of Nora Luca. Izidor seems to understand and takes him to his village. Stéphane believes that Izidor will take him to Nora Luca when the time has come. Tony Gatliff is a Romani (Gypsy) director, hence his numerous Romani (Gypsy) themed films. The beauty and fine music of Romanian Gypsies is what make this movie so extraordinary. The women have such a gorgeous and colorful style of dress. If I wasn’t so sensitive to cultural appropriation, I just might adopt their style of fashion. Actress Rona Hartner is thouroughly charming in her role as the Gypsy translator. Interesting film review of Gadjo Dilo here. From IMDB: Angelo My Love delves into the little understood and fascinating world of New York gypsies. Using real gypsies playing fictional versions of themselves. This critically acclaimed film explores the lifestyle, rites, myths and passions of the tight-knit urban subculture. Twelve year-old Angelo Evans is the street-wise. Charmingly precocious son of a fortune teller. When the boy accuses a sleazy gypsy, Steve “Patalay” Tsigonoff, and his foul-mouthed wife, Millie, of stealing an ancestral ring, he chases them to Canada. Angelo My Love is one of the most enjoyable movies I’ve ever watched but then again, I do have a thing for Romanies. Robert Duvall decided to make the film after being charmed by the real life Angelo. There are very few professional actors in the film, the cast is made up of his Roma family and friends. I recently met some Roma folks here in Los Angeles who said they have family that appears in this movie. Despite some of the not so favorable depictions, it seems many US Romanies love this film. For a very good review of the film, please see here. From IMDB: Caco is a proud, handsome man, head of a family, and very powerful in the local community. Yet he has been torn to pieces by the death of his beloved daughter. He constantly visits her grave, weeps silently at her photo and has transferred all his wildly protective love and attention onto his mentally challenged nephew, Diego. I would love to have a party like this one day! This song is so infectiously catchy. It sticks in my head for days at a time. 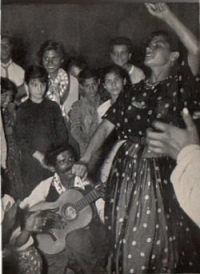 By the way, the woman singing to the left of the guitarist is Remedios Silva Pisa. Remember her because she is the focus of next week’s video selection. Scenes from the movie La Faraona starring Lola Flores singing Un Mundo Raro. A real gem of a movie made during the golden age of Mexican cinema. The story is of a young Gitana who moves back to Mexico from Spain when she receives news her rich uncle is on his death bed. Of course, she brings her Gitano tribu along with her and they all dazzle the Mexican family with their flashy Flamenco moves. I love the beginning scene where she attempts to speak Mexican Spanish and even attempts a grito. I wonder if my attempts at Flamenco jaleos sound like her gritos. Oh, oh. I also picked this scene because it features a more authentic kind of Flamenco and not the wild, skirt flipping personal style of Spanish dancing Lola Flores is famous for. Hope you enjoyed this small sampling of clips. There are many more I’d love to share and perhaps one of these days I’ll get around to compliling a part two. *Romani is the preferred term for the people known as Gypsies. Gitano or Calo is often used in Spain to describe Romanies and in the Balkans, Cigani or Tsigane is commonly used.